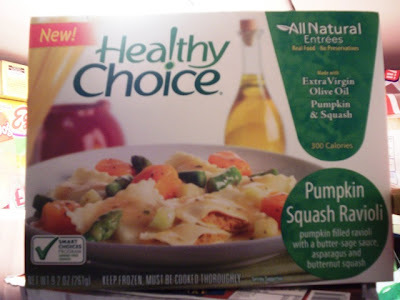 I love the television show Seinfeld, so when the woman who played the Elaine character was seen advertising Healthy Choice's new pumpkin squash ravioli, I just had to try it. After all, Elaine wouldn't lie to me. If she was behind this frozen meal, then it had to be good. Since it was on sale at Stop & Shop for $2.50, I decided that it was now or never. Also, we have been receiving requests for us to feature healthy frozen food options, so I figured that the ravioli would be a perfect candidate for our Bite of the Week. THE VERDICT: Surprisingly good! 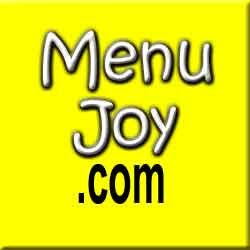 You all know how frozen meals can be. They never look like they do on TV, and they taste more like the box they come in rather than what they were supposed to be. Fortunately, this meal had it goin' on. 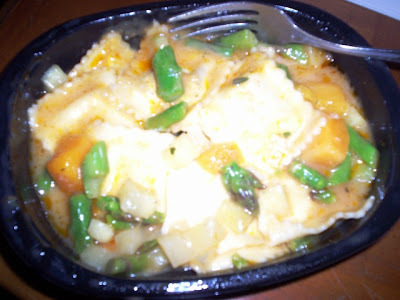 For only 300 calories, I got to have about five delicious pumpkin raviolis in a butter sage sauce (which was very tasty) and a small helping of asparagus and butternut squash. The vegetables were crunchy and fresher than I expected. The raviolis were nicely filled and had microwaved well (nothing was burnt). Made with extra virgin olive oil, this frozen meal would be a great choice for anyone who needs to eat on the go or in their office cubicle. I knew Elaine wouldn't steer me in the wrong direction!